All Posts Tagged With: "Tom Harkin"
Former US Attorney Matt Whitaker announced today that he intends to be a candidate for the US Senate seat being vacated by Senator Tom Harkin (D-Iowa), and will make the official announcement on June 3. Â He made the announcement today on WHO Radio’s Simon Conway show. Whitaker is currently the managing partner atÂ Whitaker Hagenow Gustoff LLP. Â HeÂ served as the United States Attorney for the Southern District of Iowa from 2004 to 2009, and previously worked for two other law firms and SUPERVALU as corporate counsel. Â in 1998, Whitaker graduated from the University of Iowa College of Law and also earned his MBA there. Our esteemed Senator Harkin has been holding some hearings on for-profit colleges back in D.C., and now he has penned an editorial for the Des Moines Register. 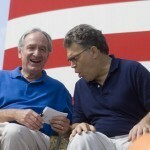 In full disclosure, I dislike Tom Harkin. Intensely. Then again, back in 2008, Charles Grassley voted for the TARP bailout, and now I donâ€™t like him either.